First Line: I received an email message. When a woman comes into Questions Answered, proprietor Samuel Hoenig wants nothing to do with finding the answer to her question. "Is my husband having an affair with a dead woman?" To the literal-minded Samuel, there's no question that the man isn't because ghosts do not exist. But his associate, Janet Washburn, feels differently about the situation, so Samuel decides to give her her first solo assignment: to answer this question. However, as soon as Ms. Washburn begins to investigate, the husband turns up dead. Now she and Samuel have a lot of work to do because even Samuel can see that things just do not add up. This fifth Asperger's mystery is another enjoyable read because not only are we served up a lovely plot with plenty of twists, fans of the series get to witness the further emotional growth of Samuel Hoenig, a man with Asperger's Syndrome. Samuel is logical, literal, and precise. Readers see the world through his eyes, and how he words things shows us how literal his vision is. For example, he never refers to Ms. Washburn's mode of transportation simply as a car or the Kia, it's always the Kia Spectra. He also works through conversational terms that are nonsensical to him. I really appreciate this chance to experience Samuel's world, all the while knowing that, from time to time, being with someone like him 24/7 could be exhausting to a person who's not used to it. This is a series best read in order because, throughout it, Samuel's emotional relationships become deeper and more meaningful. The books aren't merely matters of answering the question du jour and solving the mystery, but also of Samuel becoming more sensitive to the emotions of the people he cares for. Jeff Cohen's Asperger's mysteries are something very special. Readers get to flex their deductive muscles in an attempt to solve some first-rate mysteries, and they are also treated to the gradual development of an extremely interesting character. 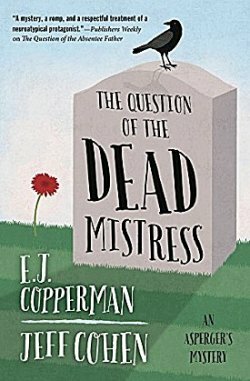 The Question of the Dead Mistress is the best book in the series so far, and I'm looking forward to reading many more. It's not easy to write a series about someone with a disability, and make it both convincing and respectful. I'm glad that happens here, Cathy, and it is interesting to see how a character grows over the course of a series. If anyone can do a good job with a character like Samuel, it's Cohen.